Trinket jewelry boxes are adorable little storage made of enameled pewter and designed with glossy colors that are eye-catching. They are indeed the perfect giveaways you can think especially in occasions like weddings, family reunions and anniversaries. They are not just adorable, but they are also used in storing necklaces, rings and pendants. 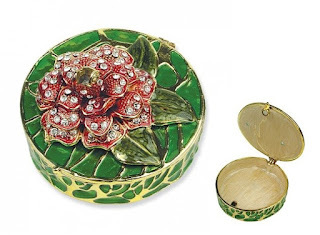 This Floral Trinket Jewelry Box is beautifully crafted in brass or pewter. Each little treasure box is a work of art that has been carefully hand enameled in amazing shapes and colors. It features a floral rose design set into a green pewter body designed with asymmetrical leaf designs. 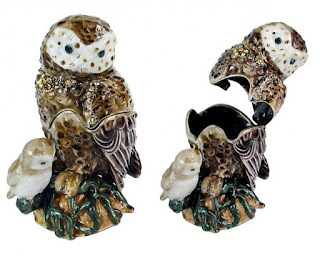 Treat yourself or someone special with this unique Owl Mommy & Me Trinket Jewelry Box, This adorable jewelry trinket box is use to store small items, and opens on a hinge. It also has magnetic closure to keep the box shut securely. This unique trinket features an older mother owl along with her chick, painted in artistic perfection. 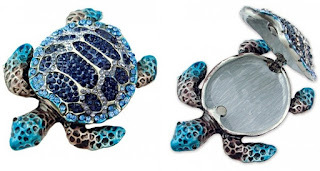 One of the majestic being living under the sea, this one-of-a-kind trinket jewelry box was crafted into a beautiful turtle composed of either brass or pewter. It has been carefully hand enameled in its colors and is set with crystal stones for a sparkling presentation. This trinket jewelry box is made perfect for women who want an adorable and classic piece to store her jewelries. It is made of enameled pewter, accented with sparkling crystals and features a removable top lid with magnets. For all who loves to drink coffee, then this adorable trinket coffee box is something that you'll like to be display on your room. 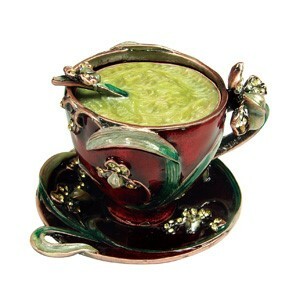 It is made of enameled pewter and carefully been painted with lovely colors that gives off a classic look. This trinket box is the perfect give-away to your coffee-holic friends. 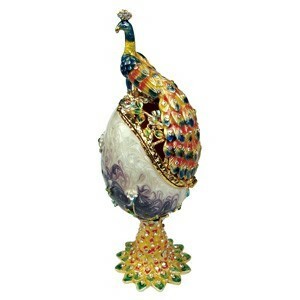 This Trinket Peacock Box is a little jewelry box that depicts the beautiful colors that only the majestic peacock can give more than any other. It's a work of art that has been carefully hand enameled in amazing shapes and colors.